Here is my five top five features every kitchen should have. 1) Interior Cabinet Lighting Light up your most used drawers, corner storage and tall pantry cabinets with lights controlled on a sensor that engage when the drawer or door opens and closes. Save your sink base from water leaks with a protective thick rubber mat that can hold up to a liter of liquid from seeping into your cabinet and damaging your sink base floor. A very functional kitchen accessory that should be a mandatory item with every kitchen cabinet order. Also an easy add on for existing cabinets. It comes in various sizes including 21″ depth for vanity sink base sizes. The most awkward cabinets are narrow 12″ width base cabinets with a single top drawer and a door with a shelf below. Make a narrow space more functional with a pull out drawer dedicated to a specific use. 12″ has never been more functional for storing kitchen utensils next to the cook top or in the bathroom for curling irons & hair dryers. Small Space + Touch Latch Hardware + Toe kick drawers = Storage Love! Townhouse kitchens, small kitchens with minimal drawer space can really benefit from found space in your 4 1/2″ toe kick area. Locate these wonderful toe kick drawers underneath your sink base or any base cabinet for more storage. I can think of a million ways to use my toe kick storage! A place for dog leashes and cat toys. Long barbecue utensils I don’t want to take up prime real estate in my top drawers, large platters and serving trays, extra canned goods, foils and plastic wrap, extra gadgets that I need near by but don’t want in my top drawers. Toe Kick Drawer No decorative hardware provides a cleaner look. Open with just a tap. My favorite item in a kitchen is drawers! There are so many options today for larger storage up to 48″ wide. Sink base drawers, cook top deep drawer storage. The possibilities are endless. Transform MOOVIT into an internal drawer box by adding internal drawer accessories. This is a beautiful way of handling a small kitchen space. Kitchen designed by City Studios. I love the slate blue accent color on the island against the white cabinets. Rustic details like the warm-toned recycled antique terra cotta floor. The kitchen’s eco-friendly curved soft ivory concrete countertops are made with concrete – a locally made material – and were given have a patina for an aged look. Other details: energy-efficient appliances, insulated and double-paned windows and door and drawer hardware made from high-quality recycled metal. For the full story visit: SF Gate: Greening the Kitchen. So you have a small kitchen. Now what? What to do when expanding is not an option? Take a look at these two kitchens and look at the solutions these owners came up with. The first picture shows a small kitchen remodel without knocking down a wall. Upper wall cabinets are gone. Open shelving to the left. Drama in the hood, wall pot rack accents stainless steel counters, warmth and appeal provided by the Boos Chopping Block, red stools and Black and White floor. Full length subway tile running bond behind the stove. Busy? Never. Charming? Of course! This second kitchen below knocked down the partition wall. Before: A typical isolated kitchen with dated details. The partition wall was non load bearing and came down. The typical single kitchen window was replaced with three single hung windows providing a flood of light and making the space appear larger. Read all the details at Funky Junk Interiors. Here is a great use of unconventional materials: metal top on the island and laminate tops on the perimeter. Check out more photos at Funky Junk. Amazing transformation. Great job, on a small budget! Paint Cabinets and remove the doors. Use white tile. It is less expensive without adding deco inserts and liners. Subway tiles add authentic classic look. 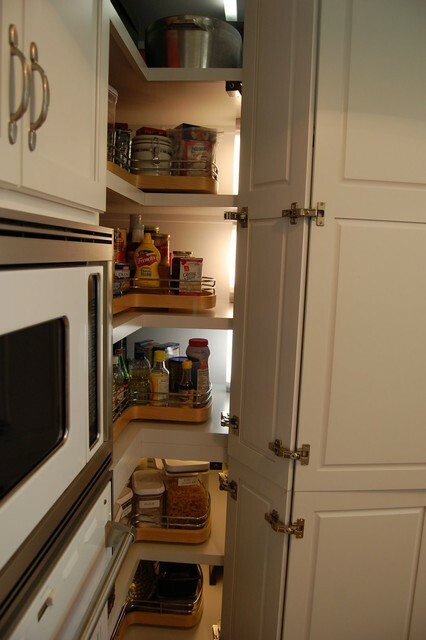 Order cabinets with Recessed 1/4″ panel doors to keep the cost down. Order cabinets in Hickory, Oak or Alder to keep cost down. If you have a small kitchen you are familiar with a big problem. Spices are the odd men out in small kitchens and shoved around from here to there to make way for more storage. You’ve moved the spices to the drawer to gain glass or plate storage. You moved the spices out of the drawer and shoved them in the pantry to gain storage space for the utensils. Then you wind up with a spice spinner that takes up valuable real estate on the counter. Here is a great little solution for spices that frees up precious storage space needed for other kitchen essentials. Try this set of 24 magnetic spice jars to fit on your fridge. Hexagonal shape fits together creating a spice-colored honeycomb pattern on your fridge. Strong neodymium magnets will keep jars from sliding. Caps are die stamped with spice names. Gold plastisol lids form an airtight lock, keeping spices fresh. Follow the link to contact GneissSpice at ETSY. 1.5 oz. jars accommodate more than enough spices. However, when you buy spices from the grocery store–they are often more than 1.5 oz, so be sure to buy the smaller containers or buy from a bulk store and save packaging! (Or, purchase the 4 oz. jars). Smaller amounts of spices stay fresher as they are replaced more often. Buy just enough and never buy spices in “Restaurant Size” unless you are cooking in restaurant size quantities. Nothing ruins a meal quicker than old, stale spices. Design Solutions: Don’t want to clutter your refrigerator? Do you have wooden panels on your refrigerator with no magnetic space for attaching? Or are you just a die hard cook that would not dream of storing spices in natural light? Buy a magnetic/dry erase board that fits the inside of a wall cabinet door or pantry. Arrange the spices so they do not interfere with the fixed shelves in the cabinet or if your shelves adjust, raise or lower a shelf so that the spices clear when closing the door. Saturday musings: Paring down with Wabi Sabi. Photos of simple, unadorned rooms I admire. Photos from Apartment Therapy via Sköna Hem and Emmas Design Blogg: Unlike shabby chic, wabi-sabi decor inspires minimalism that focuses more on the people who live in the space than anything else. The aesthetic of Wabi-Sabi is sometimes described as one of beauty that is “imperfect, impermanent, and incomplete” (according to Leonard Koren in his book Wabi-Sabi: for Artists, Designers, Poets and Philosophers). The concept of finding beauty in “imperfect, impermanent, and incomplete” may be more true in today’s economy than ever before. Look for beauty in found objects, your grandmother’s antique hutch, a hotel letter box. Here are two before and after photos from Coastal Living. What I love about this kitchen is how light and airy it now looks. Removal of the dropped fluorescent light panels in the ceiling. New but vintage inspired, is the clap board detail on the walls. Iridescent glass tiles in sea shades for the counter top. The pantry door is a vintage looking screen door painted in blue. Very clever and perfect to complete this beach cottage look. For more information on this house go to Revive Your Beach House.